In the August issue of MEGA, I wrote about South American cuisine, zooming in on Brazilian, Chilean and Peruvian food. My research for the article led me to portals and e-books featuring a variety of exciting recipes to try. Among the ones I've experimented with thus far, the Peruvian Papas Rellenas proved to be a standout. It's an exotically scrumptious albeit uncomplicated dish. Save for the cilantro, the ingredients were very easy to find in Manila. 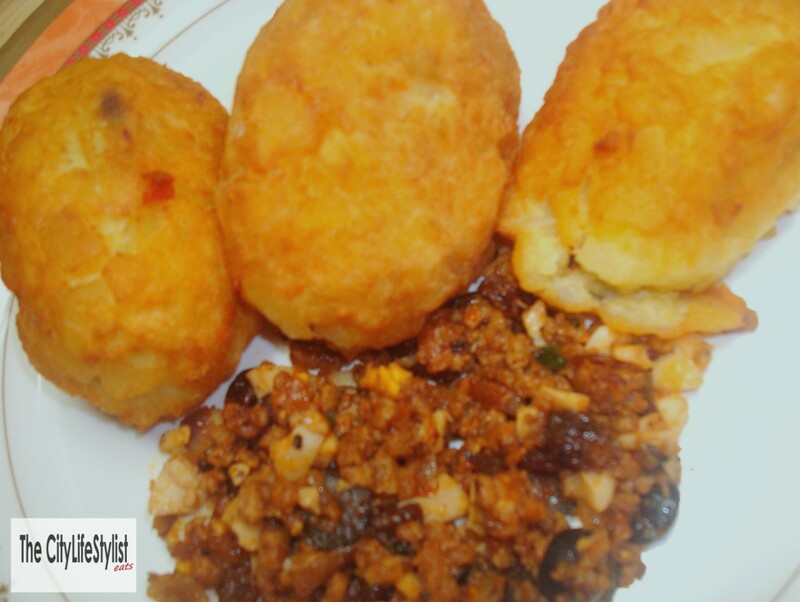 As I wrote in the feature, they are "deep fried mashed potatoes stuffed with ground beef, hard-boiled eggs, olives, raisins, and tomatoes mixed with onion, garlic, parsley and cilantro." They are "crisp on the outside and soft in the middle, with a mildly spicy filling that tastes robust without overpowering the palate." The olives lend a tinge of saltiness while the raisins add some sweetness, creating the perfect balance of flavors. One (1) teaspoon minced cilantro Note: I had to do away with this because I didn't have any in the kitchen, but my "taste testers" thought the end product was already great as it is. But of course, I bet it would be even better with cilantro! Wash potatoes and place them in a medium size pan with salted water. Bring to a boil. Cook until soft. Remove from heat. Peel. Force potatoes through a strainer or a potato masher. Cool. Add an egg and knead dough until smooth and soft. Pour two or three tablespoons oil in a large size skillet. Cook onion and garlic until golden. Add ground beef. Add tomatoes and cook for five minutes. Add parsley, cilantro, olives, hardboiled eggs and raisins. Season with salt, pepper and paprika. Flour hands and take a portion (about half a cup) of potato mixture. Place it in the palm of your hand. Flatten it and place one tablespoon of filling (approximately) in the center. Fold it and close by pressing ends. It must have an oval shape. Flour croquettes and set them aside. Repeat this process with the rest of potato mixture. 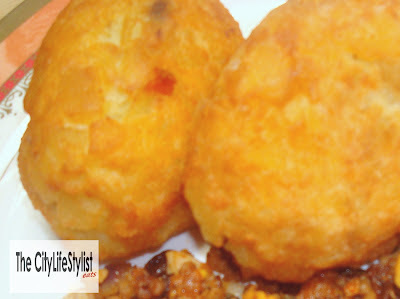 Heat oil in a medium size pan and fry each papa rellena until golden. Papas Rellenas are served with white rice and onion Creole sauce. The first time I made Papas Rellenas, I only served them with rice, thinking the onion Creole sauce was unnecessary because of how flavorful the dish already was. When I tried to make some just for fun the second time I whipped up the potato dish, I was taken aback. I made some ingredient replacements but the result was a delightfully tangy and spicy accompaniment. One to two (1-2) ají amarillo fresco/fresh yellow aji (chili), seeded, deveined, julienned Note: I went with five green chili peppers. I chopped them up and kept the seeds. Juice of three (3) key limes Note: I juiced one whole lemon. I've also tried using calamansi juice, which also worked quite well. Vegetable oil Note: The amount was not specified. I only went with a tablespoon after discovering online that other recipes for the sauce did not require it. I suppose it makes a difference in terms of the sauce's consistency. Cilantro or parsley, minced Note: I went with the parsley. 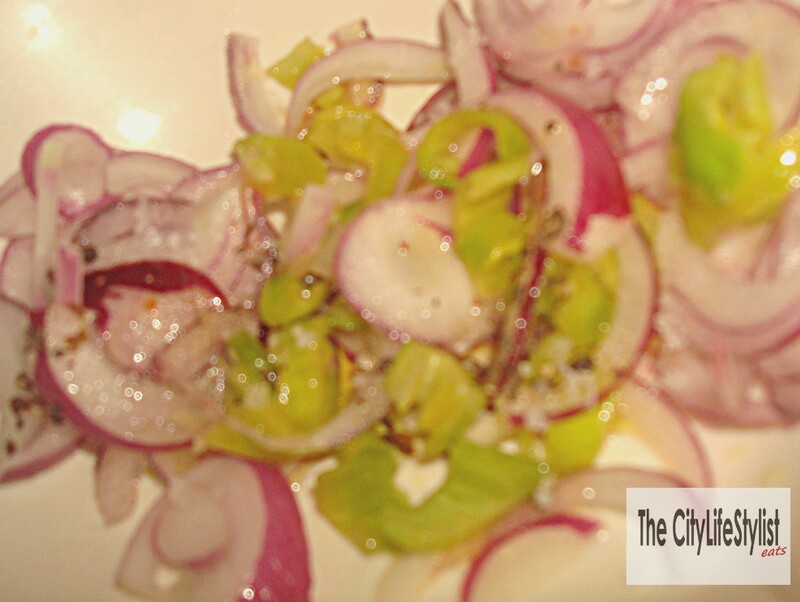 Soak the sliced onions in a bowl of water and mix well. Drain and let them dry. Place onions in a bowl and season to taste. Pour key lime (or lemon) juice, vegetable oil, and ají (or alternative). Mix well. What I like about the onion Creole sauce is that you can tweak it to your liking, but the mix of the heat and the tang always makes it a winner.